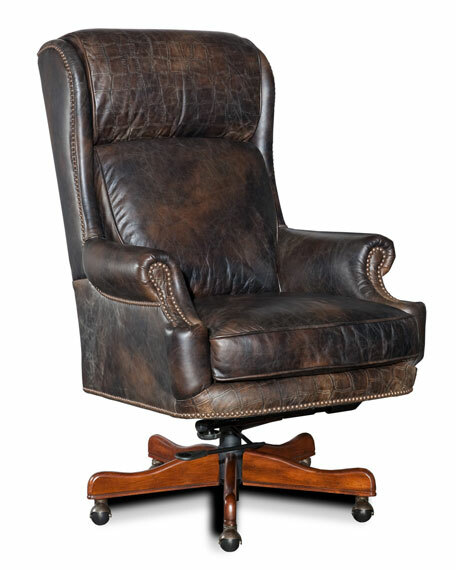 Hand-worn top-grain leather upholstery with crocodile-embossed trim. Swivel tilt mechanism with lockout. 24.5"W x 29.5"D x 45"T; seat adjusts from 19.25"T to 21.5"T.
Boxed weight, approximately 94 lbs. This chair has it all? ?the freedom of swivel mobility, comfortable seating, and modern good looks. Hardwood frame. Leather upholstery. Feather/down cushion. Mortise-and-tenon frame construction. Sinuous-spring seat. 36.5"W x 37"D x 41"T with 22.5"Sq. x 18.5"T seat. Handcrafted in the USA. Boxed weight, approximately 85 lbs. Comfy and gorgeous in charcoal leather infused with hints of brown and black. 30"W x 40.5"D x 41"T; arm, 25.5"T.
Handcrafted with chair with nailhead trim. Mahogany wood frame. Leather upholstery. Includes one leather pillow. Corner block, glued and screwed. 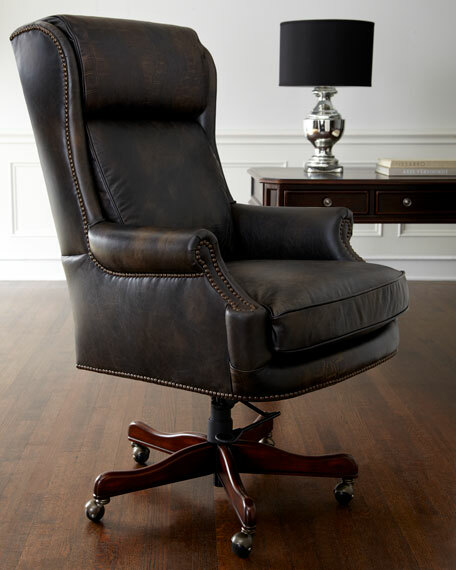 Handcrafted with chair with nailhead trim. Mahogany wood frame. Leather upholstery. Includes one leather pillow. Corner block, glued and screwed. 32"W x 38"D x 49"T. Arm height, 27". Seat height, 20". Seat depth, 24". Dry clean. Made in the USA of imported materials. Boxed weight, approximately 80 lbs.